I just finished Larry Niven’s Neutron Star; amazingly good stuff! I read a lot of Larry Niven’s Known Space science fiction back in the 80’s. I am beginning to re-read his novels. His characters and stories span several centuries, so it’s hard to know where best to jump in. I did some research and put together a recommended reading order. Below is the sequence in which I’ll be reading his epic saga. Oh, and this setting has an RPG as well. More on that in a sec. 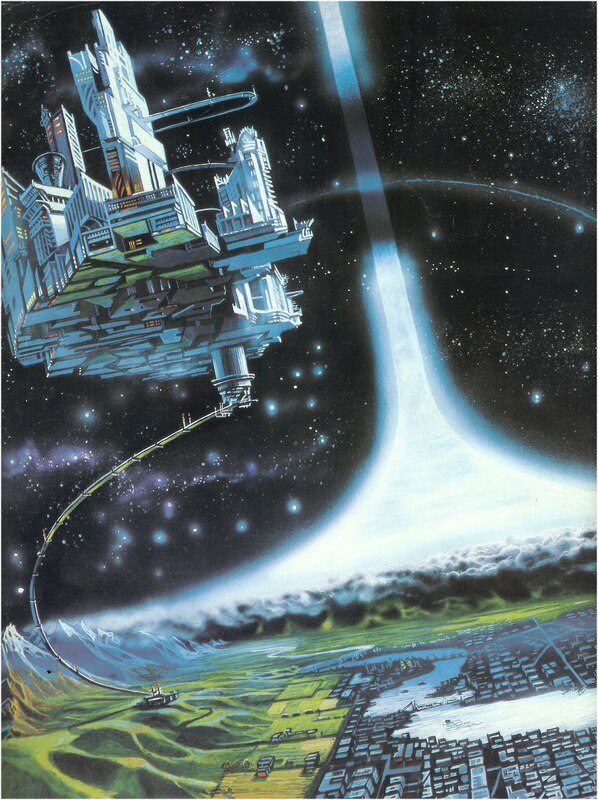 For the uninitiated, Ringworld is an epic saga that has an original series written by Niven (Ringworld, Engineer, Throne, Children) followed by a new series of Known Space novel co-authored with Edward M. Lerner (Fleet of Worlds, Juggler of Worlds, Destroyer of Worlds, Betrayer of Worlds). Ring world was originally written in 1970. It was set in his Known Space universe and is a classic of science fiction literature. Ringworld won the Nebula Award in 1970, as well as both the Hugo Award and Locus Award in 1971 (one of the few novels ever to win both the Hugo and Nebula). Niven later added four sequels and four prequels. (The Fleet of Worlds series, co-written with Edward M. Lerner provides the four prequels as well as Fate of Worlds, the final sequel.) These books tie into numerous other books set in Known Space. #1 — Neutron Star (introduces many key ideas like Known Space, Outsider Hyperdrive, and the Puppeteers). #2 — Ringworld (introduction to Ringworld). #3 — Protector (the backstory of the Pak, which is crucial to many key points in Ringworld). #4 — World of Ptavvs (reveals more about the ancient Slavers that ruled the Galaxy; this novel is included in the omnibus Three Books of Known Space). #5 — Ringworld Engineers (we discover the fate of the Puppeteers and the Ringworld). #6 — Ringworld Throne (the least gripping of all the novels; reveals Puppeteer technology). #7 — Ringworld’s Children (stunning conclusion to the Ringworld arc). #8 — Crashlander (the backstory of Beowulf Shaeffer; contains the Hugo winning Beowulf Shaeffer story “The Borderland of Sol”. Some other stories here duplicate Neutron Star. However, if you’re reading the ‘of Worlds’ series, you’ll want to read “The Borderland of Sol” first (since the Worlds series have spoilers for “The Borderland of Sol”). #9 — Flatlander (the backstory of Carlos Wu; you could skip this book though). 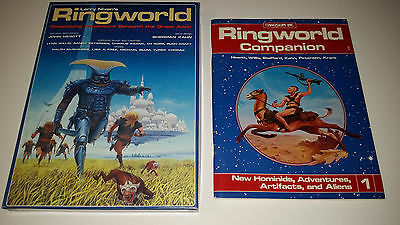 And of course I’d be remiss if I didn’t mention the Ringworld RPG. I just ordered a copy off eBay. It’s long out of print, and not sure I’d ever run the system as is. By itself, if nothing else, it serves as an amazing setting guide for Known Space. The system uses Chaosium Basic Roleplaying system and has a version of the rules used in Call of Cthulhu, Stormbringer, and Runequest. One caution I’ve read from people who’ve played Ringworld RPG is to do something about the random age rules. The rules as written will let some players have very old characters who are healthy through the use of anti-aging booster-spice and are overwhelming more powerful that a young character. Just house-rule it so everyone is around the same age and you’re good to go. I might run Ringworld RPG at NTRPGCon someday. If I ever run a campaign in this setting, I’d might use some version of Classic Traveller instead if players didn’t want to use the out-of-print rules. Don’t forget about “Tales of Known Space”! Niven was an important influence on my SF tastes (and gaming) back in the 1970s. Did any D&D campaigns NOT have Kzinti? A few years ago I ran a “Ringworld Reloaded” campaign that combined the Known Space setting (as depicted in the Chaosium game) with some of the aliens from SPI’s StarForce: Alpha Centauri. I used the FATE Mindjammer system for the rules. I’d say Niven’s female characters haven’t aged very well though, and I never liked the silly gender bimorphism in the Kzinti… so those were dropped in my game. That sounds like an awesome campaign! I love Niven’s Ringworld books. I devoured them as a kid, and the whole Ringworld disown sphere alternative world physical structure stuck with me. My first campaign included a modified Ringworld where there was the surface on the outside of a spoke, or tire world. You could in fact sail to the edge of the world and fall off. Good times. 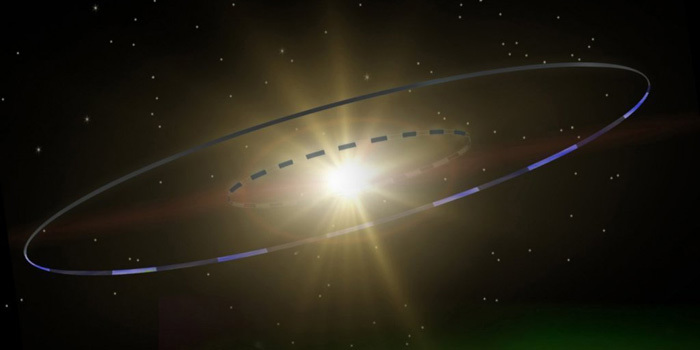 What game system did you use to run that Ringworld game? The Chaosium Ringworld RPG or maybe some version of D&D? Dungeons and Dragons 2nd edition. It had just come out, so I was Thac0 d pretty close to death. It was DnD, but the geography was inspired by Ringworld. The end of the three year campaign saw the party at the central hub of the spoke world, with ancient advanced technology all around them. After a few years of people telling me to read this, I’ve finally picked it up. I figured I’d follow your order, Stan. I’m a few short stories into Neutron Star and it’s good stuff. Let’s see how much of it I can finish before our sci fi game. Just finished Ringworld. It was great. So was Neutron Star.